A game about fishing that isn't actually a fishing game. A worthwhile catch or the one that got away? 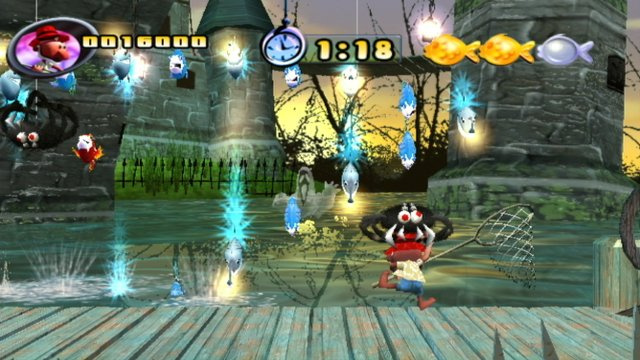 WiiWare's already got a fishing game - Cocoto Fishing Master, which isn't exactly very exciting. So when another one was announced, we couldn't help but hope it'd be a bit better. It seems like our prayers fell on deaf ears though, because although Fish'em All is about fishing, you don't actually "fish"! In the game you take control of one out of two elderly fishermen, called Jack and Walter. They've apparently discovered some locations nearby their house where fish are actually eager to get caught - so eager in fact, that they leap out of the water and all Jack and Walter need to do is catch them in their nets! Fish'em All has two control methods. You can either play with just your Wii Remote or with the Wii Remote and Nunchuk. It's strongly recommended you use the Nunchuk as well: if you use the Wii Remote there's just too much stuff you need to do with the small number of buttons it has: you'll have to use the D-pad to move, A to jump, AND you need to swing the remote to swing your net! If you use a Nunchuk, movement will be moved to the analog stick, which makes it much easier to control. The game offers three modes for you to enjoy. Arcade is simple - just score the required amount of points to clear each round before the time is up. Fish are colour-coded, so you'll get more points for certain colours, and quite a bit more if they're sparkling. The game will also gradually throw more and more obstacles at you, starting off easy, with crabs that walk across the screen, temporarily stunning you if they walk into you, but eventually there will be bigger threats, such as sharks that swallow you whole and spit you back out sometime later, making you lose quite a bit more time, and bombs that explode if you accidentally catch them in your net. 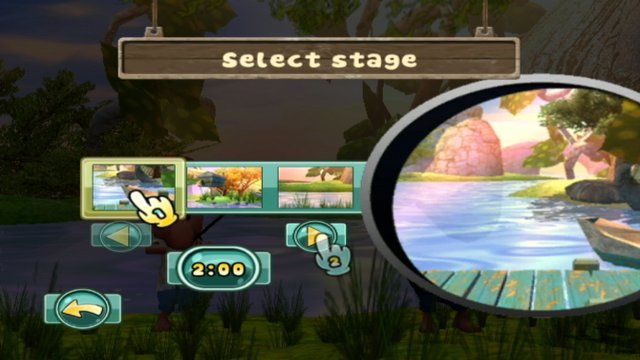 There's a large variety of these things you need to look out for eventually, so you should always be on your toes, and how many fishing games ask you to do that? Challenge mode consists of a lot of stages with different objectives. 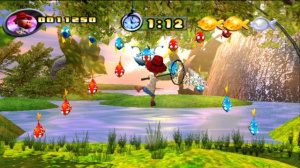 It starts off simple, with objectives like catching five red fish (with those also being the only type of fish that appears, making it eveneasier), but it won't take long to run into much harder stuff, like catching a certain amount of one type of fish, while not catching a single one of the other colours. This is where you'll start to really notice one of the game's major flaws - it's almost impossible to be accurate with the net! When you swing the net it'll make a wide arc in the direction you swung the Wii Remote in. This swing isn't really that fast, though, so you'll need to perfectly time it so that it will hit and catch a fish (or multiple fish) instead of swinging right past them. 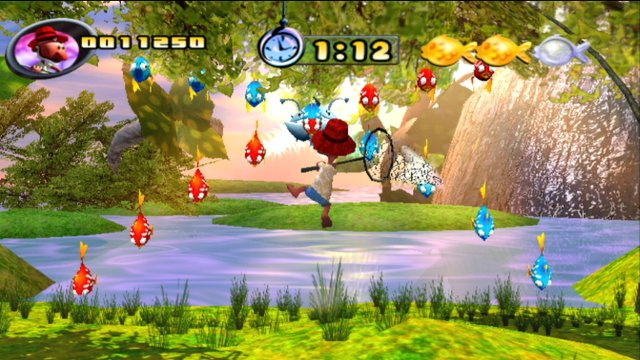 While getting a few misses really isn't that bad in Arcade mode, in Challenge mode it will completely crush you - in the last challenge I mentioned, where you need to catch one type of fish (yellow) and avoid the other (red), the fish you need to catch are very scarce. This means there's a ton of red fish with only a very small amount of yellow ones inbetween. It might not have been a problem if the fish jumped out of the water one by one, but there's basically an endless wave of the little buggers coming at you, with very few being yellow. If you mistime your swing by the smallest amount you'll catch a red one, and you'll instantly lose. 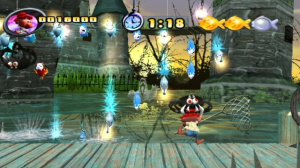 Seeing as you need to catch a whopping 15 yellow fish, you can see why some challenges will probably never be cleared. Thankfully, the net issues are slightly less annoying in the final mode - Fishtris. It's actually nothing like Tetris, but more like Dr. Mario or Puyo Puyo - you have to catch multiple fish of the same type in a row. 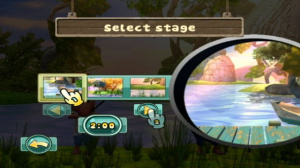 Every fish you catch will appear in a bar on the side of the screen. Catching three of the same type will clear those three and get you some points, but if you keep catching fish that aren't the same colour the bar will eventually fill up, and you'll lose. Once you get a certain amount of points, you'll move on to the next stage and the difficulty will increase slightly. Of course, as indicated by trailers, the game's main focus is the multiplayer mode. 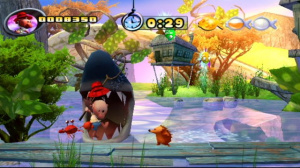 You can play Arcade (renamed "Versus") and Fishtris with two players. Versus is basically a score battle: whoever gets the most points within the time limit will win the match. Multiplayer Fishtris is a lot like Puyo Puyo: when you match up three fish of the same colour, you'll send "garbage" fish to your opponent's bar, and whoever's bar fills up first loses. The multiplayer mode is actually quite enjoyable - the control issues barely hamper the gameplay, and the sheer hectic nature of it all makes it quite fun. 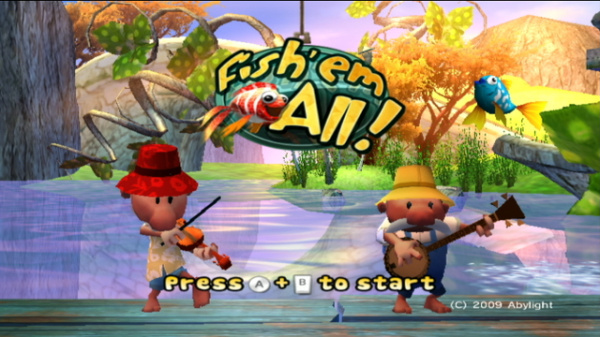 Musically and graphically the game is decent, especially if you like banjos - alll of the game's music features the instrument, which fits well with the rest of the game's style, and the background graphics for the various stages are fairly nice, if nothing to truly be impressed with. Fish'em All is a mixed bag. The Arcade, Fishtris and multiplayer modes are all quite enjoyable. 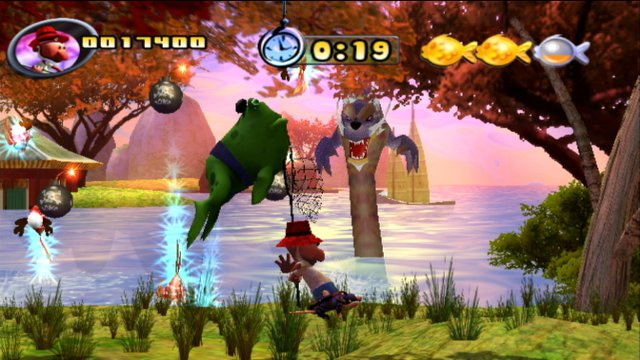 The game is really brought down by the annoying controls though - the net-swinging is just too slow and inaccurate not to get annoyed at. Challenge mode can be considered a throw-away because of it, and it'll get on your nerves in the other modes as well, even though it's not game-breaking there. If Abylight had just worked a little harder to make the controls more solid Fish'em All would've been quite a good game, but now, it's really only worth a look if you plan on playing a lot of multiplayer. The relatively steep price of 800 Wii Points is also slightly off-putting. I'm not surprised,should we also call this shovelware? I'm still planning on getting this one. I feel my daughter and I will have a blast. @SuperSonic1990 - There is nothing about this review that suggests that this game is shovelware. 6/10 means "not bad". Awwww man. I love the theme of the game so this is disappointing. I was really hoping this would score an 8 or so. Well I might still pick it up and give it a go eventually. Don't you mean a 7. Careful greyelephant, he might get offended and block you. BAN HAMMA! Lol. Anyway, as usual, great review. Glad the game holds up a bit especially for multiplayer but I'm still not getting this. Honestly, the whole premise doesn't appeal to me and I could see myself getting bored with it rather quickly. Plus, despite the different modes, it doesn't sound like the core mechanics differ too much so it's not like there's that much variety either. Too bad about the technical flaws also. Glad I waited for the review, as it confirms my expectation of the game's controls being a deal breaker. Still not getting it, but at least it's a better offer then Cocoto Fishing Master. I have to admit I had concerns about the way you need to stick the net out to catch the fish...the fact that it's tethered to a waggle control can't work in its favor. Why not just move your little man around and the fish can land wherever the net is? Why do you have to swat? It seems that there'd be enough movement to justify the challenge anyway, and this could have been a sort of modern-day Kaboom. What a shame, I had my eyes on this one, the arcady style looked like fun, actually I hoped the waggle weren't the only way to control the net since the gameplay seemed too fast paced for it; well maybe NA will get it cheaper, if so I'll give it a go. I also was hoping the net action would be mapped to a button (I read the interview mention of wiimote-only option as being classic NES-style), so waving the wiimote does get fatiguing, but it's still quite a fun game and I have no regrets. I find the best technique for catching fish is to wave back and forth rather than once; your net will extend a bit to each side. It does get a little frustrating when you miss as the collision detection seems excessively tight. I do think people shouldn't be too quick to write off 6/10 games as it's really not a bad score -- I'll certainly be playing it more than Space Harrier ! Just play more than 5 min and you will be able to clear the game easily, this game is not 6/10, it's 8/10 as minimum, learn to play before write a review . Shovelware means it was made with zero care and insufficient time merely to exploit the theme of the game, this seems like a game made with love and care but just went wrong. Even if it was an 8, I would've saved my nintendo points. I totally agree with the score and review for this game. There is no way in hell that this game is worth anything over 6/10 - I rate it 5/10 personally for the shabby controls, cheap 2/3 frame animations and the overall feeling that it's an early 90's tech demo with the basics of a game tacked on. I definitely don't think it's fair to call this shovelware; it's definitely got an arcade feel to it which I enjoy and I agree with Slayn that it does get a bit easier once you get the hang of the controls, though it's still challenging. I've only played the arcade mode thus far, but I'll be sure to try out the other two this week. Most of you should remember that this is just one persons opinion of this game and just because one person doesn't find it that good doesn't mean you will find same. i played it and found it very fun in 2 player and i really enjoy the Fishtris mode. I do agree its steep price to pay i would have preferred to pay 500 to 600 points for it instead. Fishtris is next on the list! much pretty and fun game the Fish'em All,thanks sean. I'm grabbing this one anyway. It just looks fun as hell. And the music I love.